She Weilds the Tyrant's Eye! - Chuunibyou Demo Koi Ga Shitai - She's Lost Control! Time Enforcer Anubis here with a fresh review! There comes a time in all our lives where we reflect. We look back at our youth: The dumb things we used to do, the rituals we had with our friends, the stories we came up with. Some of us try and move on. Others embrace it. Most of us fall somewhere in the middle. 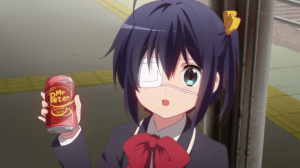 Chuunibyou Demo Koi Ga Shitai (Chuu2Koi) is a light novel adaptation by Kyoto Animation. It tells the story of Yuuta Togashi, a first-year high school student who is trying to escape his past. Specifically, back in middle school he was afflicted by a condition known as Chuunibyou (Eighth Grade Syndrome). 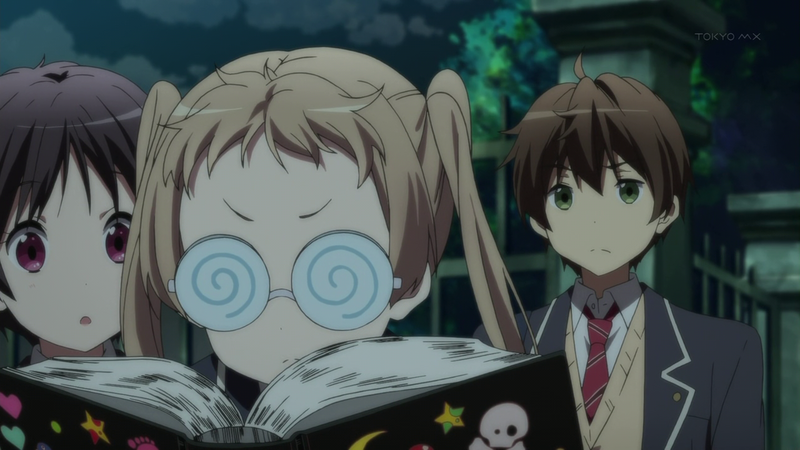 Chuunibyou affects everyone differently, but is based in an adolescent delusion of grandeur. 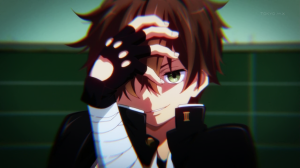 Suffering from his Chuunibyou, Yuuta took on the persona of the “Dark Flame Master,” dressed like a role-playing game character, and altogether embarrassed himself in front of his peers so much that he chose a highschool that nobody from his middle school would pick. 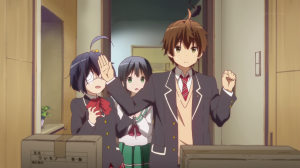 There, however, he meets Rikka Takanashi, who’s taken her Chuunibyou with her to high school, and is intent on including him in her antics for some reason. 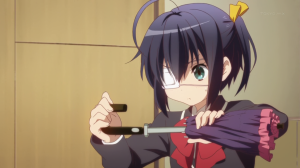 Chuunibyou Demo Koi Ga Shitai is a show presented in halves. Though not specifically separated into two halves, there are two quite separate moods present here. The first half is a comedy. Raucously funny, extremely cute, and interspersed with exciting fantasy-world battle scenes, the first half of Chuu2Koi is light, silly, and quite charming. The interaction between characters with Chuunibyou and those without it is a constant source of hilarity and is highly engaging to watch, as we learn a bit about them and how and why they act the way they act. The second half, however, takes a different avenue, becoming more drama-focused than comedy-focused. 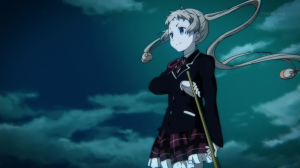 We zero in on Rikka’s Chuunibyou, her reasons for developing it, and just why she perpetuates it. Her past is given more prominence, as well as the character of her sister, Touka Takanashi, who’s been trying to get Rikka to give up her fantasy world. 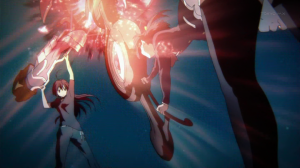 As is par for the course for KyoAni series, Chuu2Koi is visually beautiful. Moments of particularly stunning animation, rife with vibrant colors and fluid movements (The battle scenes are good examples), are linked inbetween by more mundane, but still quite above-average animation and art. In addition, the show sports a lot of slapstick comedy, though this is heavily subdued during the second half. The idea of splitting a show in half isn’t easy to pull off correctly, especially when the split is between comedy and anything serious. Unfortunately, Chuu2Koi doesn’t manage to make the transition seamlessly. The transition from funny to serious in Chuu2Koi is jarring at first, takes some time to get used to, and is the series was over before I could develop the kind of emotional connection that would have made the drama work for me. All that said, however, if you’re looking for a lightweight anime with an incredibly relatable premise, do give Chuunibyou Demo Koi Ga Shitai a try. Fans of comedy will certainly enjoy the first half of the series, at the very least. Fans of both comedy and drama will get the most out of Chuu2Koi, but fans of drama who dislike comedy might be left in the dust, as the comedy half is essential for establishing the characters. I really like how the comedy and drame of Chu2 were pulled off. It wasn’t forced and it didn’t feel narm inducing (unlike Ano Hana or Black Rock Shooter TV). I think the drama was well-presented (KyoAni once again masterfully conveying emotion), but I think the transition from comedy to drama could have been better handled, and I think the drama half could have benefited from being an episode longer, to give the characters more time to change and develop. All of the character development took place in half a cour, and the entire drama half felt a bit rushed by the end of it. I think that, had they had another episode near the beginning or early middle of the drama half, it would have made for a more natural transition and a more well-paced show overall. This has to be one of my favorite shows that KyoAni has produced period. I really love the characters (except Nibutani) as well as the premise. I also agree that the drama was well done here. Few shows of it’s type really know how to hit the right emotional chords. This show is one of them.